The outside kitchen …coming soon! 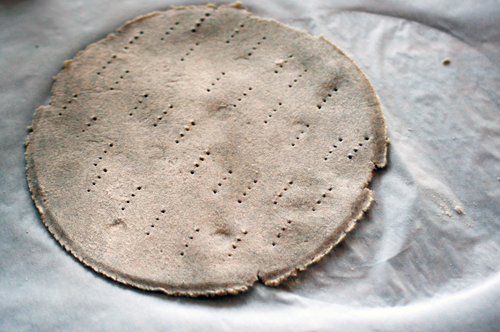 Icelandic flatkaka, it´s healthy – why not try it! I am dreaming of a kitchen outside. Shouldn´t be a problem and it´s on the drawing table since we are building our dream house in the country. The weather here in Iceland in´t that special, but we get really good days once in a while and then it´s so worth it to have a good cooking facility outside. I am not the sun bathing type so being able to be outside and cook, what a dream! I have a little oven I put outside the other day when the weather was so nice. 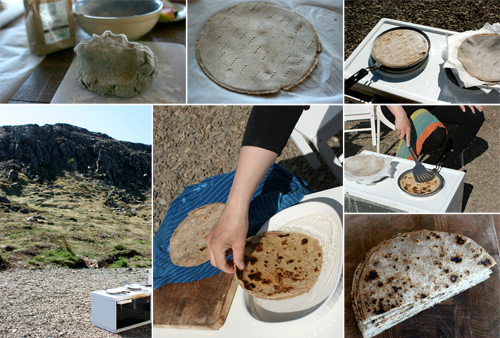 I made the Icelandic flat bread, because it can get smoky when making it I used tthe opportunity to do it outside. It was so relaxing, baking outside in the sun. It wasn´t me being baked but the bread, that´s better. 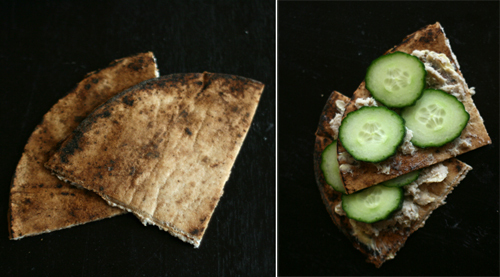 I grew up eating this flat bread and I love it. I also love rye flour. If you do, you should try this recipe. Don´t forget to dip the cakes in water after you bake them. I use a pancake pan, cast iron would be good, or just any pan you have. Blend all ingredients together, pouring the water in little at a time. 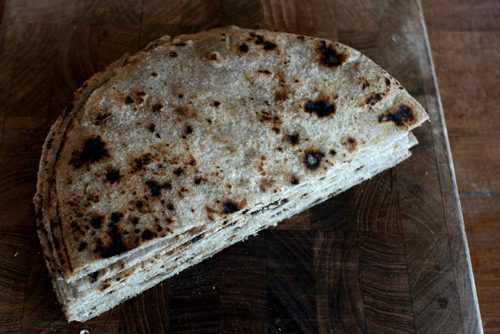 It´s like making any bread dough, or like tortillas. Make little balls and flat them out in round cakes. 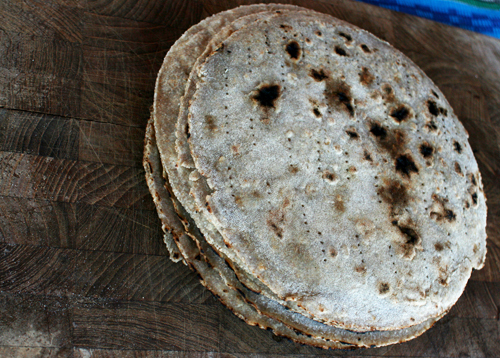 When you flat them out, I use all purpose flour for dusting so they don´t stick to the rolling pin. Poke the cake with a fork few times. I use a plate I cut around, same size the pan to make them perfect circle . Bake it on a hot pan (dry pan, no oil or butter on the pan) for about one minute each side. 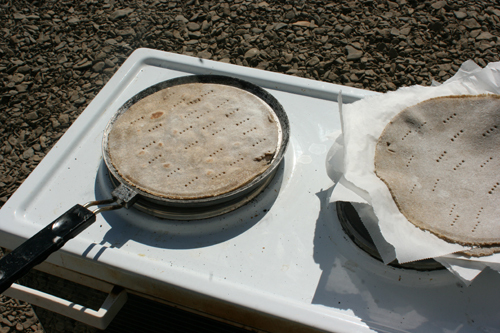 I have parchment paper between the cakes before cooking so they don´t stick together. Dip them in water after cooking and store them in a plastic bag or under a wet towel to keep them moist and soft. Cut the flat cake circle in half. Serve with butter and even some sliced cucumber. I love it with lamb pate. This is a video in Icelandic about making flatkaka, but you don´t have to understand the language to get a better idea how flatkaka is made. Hey Sofia, I’ve just been in Iceland and I brought this bread with me to Germany, because I found it funny. Back home I tried it and found it delicious additionally. Now I will try your recipe and build up stocks with that bread 😀 I would like to freeze it, but for how long can I store it in the fridge? Great to hear, it sure is good. You can probably store it as long as any other bread.